Ruining It for Everybody, Jim Knipfel's 3rd memoir. An anti-spirituality spiritual manifesto. The Buzzing, a novel about an aging and embittered journalist who stumbles onto what may be the story of a lifetime. Quitting the Nairobi Trio, available in hardback or trade paperback. Slackjaw, available in hardback or paperback. Also available, Blindfisch, the German translation. Copyright Jim Knipfel. All rights reserved. The Orson Welles question has been coming up lately. The question being whether Welles' slow, sad decline during the last 20 years of his life was his own doing—a genius crippled by his own massive appetites and hubris—or was instead the result of a Hollywood system that crushed a true maverick. In short, was he a one-man Greek tragedy or the victim of Philistines? 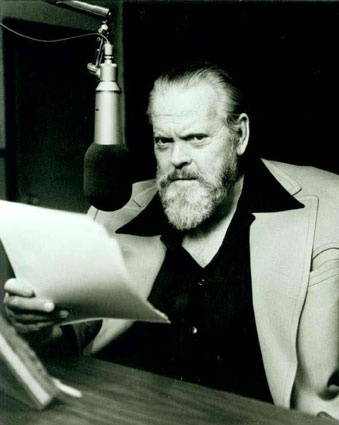 Welles, of course, argued the latter time and again: He took two-bit acting roles in films like Butterfly, appeared on The Muppet Show, and shilled frozen peas, he said, to finance his own projects, given that no one else was giving him any money. People in the movie business both here and abroad counter that they wouldn’t give him any money because he threw it away and could never finish a project. Because I love and respect his work as much as I do, I want to side with the underdog. This was Orson Welles, for godsakes: a uniquely brilliant human being who gave us the Mercury Theater, Kane, Touch of Evil and so many other things—so of course the Machine had to destroy him. But I really don’t know the final answer to the question. After all, he did do an awful lot of crap and never did finish up those dozen or more projects he’d been working on since the mid-60s. All I know is that it always saddened me to see him playing the fat clown on talk shows. I took it as just more proof that if people call you a genius when you’re 25, you’re doomed, doomed, doomed. History’s full of examples of this, of which Welles remains perhaps the most obvious and public. Thank god I never had that problem, but I’ll tell you, there are an awful lot of people out there who do. Especially in New York, land of the indulgent parent. You see them on the buses and subways, you hear them in stores and in the streets. All these proud teeny geniuses. Quite a few of them have found their way into the pages of NY Press over the years. Why, just the other day Morgan and I were tallying up the litany of failures. Most are either in college or freshly sprung, still clutching those shiny new Journalism or English degrees, convinced they’re going to set the world afire with their unique take on politics, or maybe they’ve just discovered this band called “The Replacements” that no one’s ever heard of, or hey!—they just went to Coney Island and man, is it weird down there! More than a few have shown up while still in high school, and there’s no denying that they wrote surprisingly well for someone of that age. Poor little fuckers. I always feel bad for them. So very doomed. Not all of them were doomed, of course. Without naming names, one or two had the stamina to make the game for a few months. Others, though, hoo-boy. They get that first story published, they get a week’s worth of attention, it goes straight to their heads, and look out—here comes the breakdown or the overdose. Funny how fast the young can slide into self-destruct mode. There was a kid here once who, a week after his first piece was published, was on the phone telling the editors that he was “the Baby Jesus.” He meant it too. Then he disappeared for good. Most of the little geniuses disappeared—and even if they didn’t disappear completely, they stopped writing. I’m reminded of a musician friend of mine who just couldn’t get over those t.v. dramas featuring young people trying to start bands. Maybe it has something to do with this culture of instant gratification, you know? One record review, one book, one demo tape, one short film, and they think that’s all they need to do, that the rest will simply be delivered to them. But they forget that there’s the story that needs to be written for the next week, and the one after that, and the one after that. That instant gratification, see, is also accompanied by shrinking attention spans. Hell, I’d been doing this for eight, nine years when a guy told me, “You know if you stopped now, people would forget you by next week.” Not the nicest thing to say maybe but true. Time was you could, say, put out a book every six or seven years and people would still remember you. Not anymore—now you need to pump out one a year or die (in a publishing sense). Man, I’m getting way too deep into this for a stupid 900 word column. Leave it at this: the lesson of the day is, if you’re in high school or college and someone calls you a “genius,” run and hide. And hide for a long time—at least until you forget that anyone ever pointed that word in your direction. Otherwise you might end up doing frozen pea commercials, too.